The average channel capacity and the SINR distribution for multiuser multiple input multiple output (MIMO) systems in combination with the base station based packet scheduler are analyzed in this paper. The packet scheduler is used to exploit the available multiuser diversity in all the three physical domains (i.e., space, time and frequency). The analysis model is based on the generalized 3GPP LTE downlink transmission for which two spatial division multiplexing (SDM) multiuser MIMO schemes are investigated: single user (SU) and multiuser (MU) MIMO schemes. The main contribution of this paper is the establishment of a mathematical model for the SINR distribution and the average channel capacity for multiuser SDM MIMO systems with frequency domain packet scheduler, which provides a theoretical reference for the future version of the LTE standard and a useful source of information for the practical implementation of the LTE systems. In 3GPP long term evolution (LTE) (also known as evolved-UMTS terrestrial radio access (E-UTRA)), multiple-input multiple-output (MIMO) and orthogonal frequency division multiple access (OFDMA) have been selected for downlink transmission . Both Spatial Division Multiplexing (SDM) and frequency domain packet scheduling (FDPS) have been proposed. SDM simply divides the data stream into multiple independent sub-streams, which are subsequently transmitted by different antennas simultaneously. It is used to improve the spectral efficiency of the system. FDPS allows the packet scheduler at the base station (BS) to exploit the available multiuser diversity in both time and frequency domain. In , it is shown that the MIMO schemes with combined SDM and FDPS can further enhance the system performance. This paper investigates the average channel capacity of the multiuser SDM MIMO schemes with FDPS for the generalized 3GPP LTE MIMO-OFDMA based downlink transmission. Both open loop and closed loop MIMO (open loop and closed loop MIMO correspond to the MIMO systems without and with channel state information at the transmitter, resp. ) are considered as possible solutions in 3GPP LTE. However, the closed loop solution provides both diversity and array gains, and hence a superior performance. Due to its simplicity and robust performance, the use of linear precoding has been widely studied as a closed loop scheme [2, 3]. In this paper, we refer to the open loop MIMO as the SDM MIMO without precoding, and the closed loop MIMO as the linearly precoded SDM MIMO. Most of the existing work on linear precoding focuses on the design of the transmitter precoding matrix, for example, [3, 4]. In [5, 6], the interaction between packet scheduling and array antenna techniques is studied based on a system level simulation model. The interactions between multiuser diversity and spatial diversity is investigated analytically in , with the focus on space time block coding. In a more recent paper , system performance for open loop MIMO systems with zero forcing receiver was analyzed. To the authors knowledge, theoretical analysis of linearly precoded multiuser SDM MIMO systems combined with FDPS has not been studied so far. In this paper, we conduct a theoretical analysis for signal to interference plus noise ratio (SINR) distribution and the average channel capacity in multiuser MIMO systems with SDM-FDPS. The packet scheduler is able to exploit the available multiuser diversity in time, frequency and spatial domains. Although our study is conducted for the generalized 3GPP LTE-type downlink packet data transmission , the analysis method is generally applicable to other packet switched systems. In the remainder of this paper, we present the multiuser SDM MIMO system model in Section 2, where the FDPS algorithm is also discussed. Sections 3 and 4 describe the SINR distribution for open loop and closed loop MIMO schemes, respectively. The average channel capacity of the investigated systems are given in Section 5. The analytical and numerical results are provided and discussed in Section 6. Finally, the conclusions are drawn in Section 7. In this section, we describe the system model of multiuser SDM MIMO schemes for 3GPP LTE downlink transmission with packet scheduling. The basic scheduling unit in LTE is the physical resource block (PRB), which consists of a number of consecutive OFDM sub-carriers reserved during the transmission of a fixed number of OFDM symbols. One PRB of 12 contiguous subcarriers can be configured for localized transmission in a sub-frame (in the localized FDMA transmission scheme, each user's data is transmitted by consecutive subcarriers, while for the distributed FDMA transmission scheme, the user's data is transmitted by distributed subcarriers .) With the localized transmission scheme, two SDM schemes are now under investigation , that is, single user (SU) MIMO and multi-user (MU) MIMO schemes. They differ in terms of the freedom allowed to the scheduler in the spatial domain . With SU-MIMO scheme, only one single user can be scheduled per PRB; whereas with MU-MIMO scheme, multiple users can be scheduled per PRB, one user for each substream per PRB. The frequency domain (FD) scheduling algorithm considered in this work is the FD proportional fair (PF)  packet scheduling algorithm, which is being investigated under LTE. With the FD PF scheduling algorithm, the scheduler selects users at the th time slot according to , where is the average received SINR for user at the th time slot over a sliding window of time slots. When the average received SINR for different users are different, which is the usual case of the system, the distribution of the average received SINR has to be calculated based on the distribution for the instantaneous received SINR. Since the average SINR is obtained by averaging the instantaneous received SINRs in a predefined time interval, with the knowledge of the distribution of the instantaneous received SINR, the distribution of the average SINR can be calculated based on the characteristic function . In this paper, for simplicity, we only consider the case that all users in the system have equal received SINR based on a simplifing assumption similar to those made in . In our future work, we will extend it to the case that all users have different average received SINR. The simplifying assumptions are fading statistics for all users are independent identically distributed, users move with same speed and have the same access ability, is sufficiently large so that the average received user data rates are stationary, and the SINRs for all users are within a dynamic range of the system, where a throughput increase is proportional to an increase of SINR, which is usually a reasonable assumption. When all users have equal average received SINR, the scheduler at the BS just selects the users with the best effective SINRs (the unified effective SINR is defined as the equivalent single stream SINR which offers the same instantaneous (Shannon) capacity as a MIMO scheme with multiple streams . Let , , be the SINR of the th substream, and be the unified effective SINR, then , so . The distribution of can be derived given the distribution of . The purpose of introducing unified SINR is to facilitate the SINR comparison between SU MIMO and MU MIMO schemes.) This assumption becomes valid when all users have roughly the same channel condition, so that the received average throughput for all users are approximately the same. where is a circularly symmetric complex Gaussian noise vector with a zero mean and covariance matrix , that is, . is the channel matrix between the BS and the MSs at the th PRB and is the transmitted signal vector at the th PRB, and the is the data symbol transmitted from the th MS, . where is the precoding matrix. For the MU-MIMO SDM scheme with linear precoding, we use the transmit antenna array (TxAA) technique  which is also known as the closed loop transmit diversity (CLTD)  in the terminology of 3GPP. The TxAA technique is to use channel state information (CSI) to perform eigenmode transmission. For the TxAA scheme, the antenna weight vector is selected to maximize the SNR at the MS. Furthermore, we assume that the selected users can be cooperated for receiving and investigate the scenarios where the downlink cooperative MIMO is possible. Practical situations where such assumption could apply: (1) users are close, such as they are within the range of WLAN, Bluetooth, and so forth, (2) for eNB to Relay communications where the relays play the role of users; Relays could be assumed to be deployed as a kind of meshed sub-network and therefore able to cooperate in receiving over the downlink MIMO channel. In both cases, one could foresee the need in connection with hot-spots—specific areas where capacity needs to be relieved by multiplexing transmissions in the downlink. With a linear minimum mean square error (MMSE) receiver, also known as a Wiener filter, the optimum precoding matrix under the sum power constraint can be generally expressed as . Here is an eigenvector matrix with columns corresponding to the largest eigenvalues of the matrix , where is the Hermitian transpose of the channel matrix . For Schur-Concave objective functions, is an unitary matrix, and is a diagonal matrix with the th diagonal entry representing the power allocated to the th established data sub-stream, . For an open loop single user MIMO-OFDM system with transmit antennas and receive antennas, assuming the channel is uncorrelated flat Rayleigh fading channel at each subcarrier (this is a valid assumption since the OFDM technique transforms the broadband frequency selective channel into many narrow band subchannels, each of which can be treated as a flat Rayleigh fading channel.) the received signal vector at the receive antennas for the th subcarrier can be expressed as (1). where is the CDF of the received SINR for the th sub-stream and for the case of . Consequently, the CDF of the unified effective SINR can be represented by  . It was shown in  that in SDM with a ZF receiver, the MIMO channel can be decomposed into a set of parallel channels. Therefore, the received sub-stream SINRs are independent, which means that the assumption for (5) is valid. where , is the effective SINR for the th user and is the number of active users in the cell or the so-called user diversity order (UDO). Equation (6) is for the distribution of the best user, that is, the largest SINR selected from the users. In the case of , the above equation can be written in a closed form as . where is the th non-zero largest eigenvalue of the matrix , is the power allocated to the th established sub-stream of the th MS and , where is the noise variance It is well known that for Rayleigh MIMO fading channels, the complex matrix is a complex central Wishart matrix . where and . For unordered eigenvalues, the joint density function can be obtained by . where and . It was verified by simulations in  that despite its simple form, (17) provides an accurate estimation of eigenvalues distribution of the complex central Wishart matrix for Rayleigh MIMO fading channel. The corresponding PDF can be derived by differentiating (5) with respect to . The derivation of (26) is given in Appendix C.
where the function is defined as  , where , and is the complementary incomplete gamma function defined as  , and . The derivation of (34) is given in Appendix D.
We consider the case with 2 antennas at the transmitter and 2 receiver antennas at the MS for SU-MIMO case and single antenna at the MS for MU-MIMO case. For MU-MIMO case, two MSs are grouped together to form a virtual MIMO between the MSs and the BS. We first give the results for open loop SU/MU SDM MIMO schemes of LTE downlink transmission. 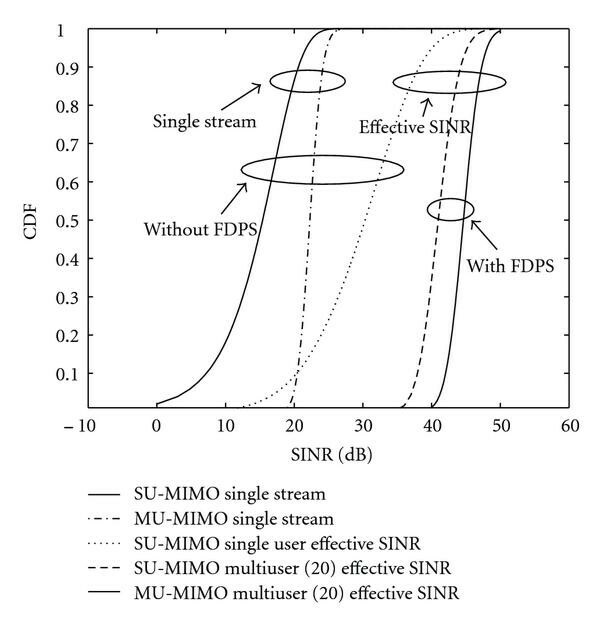 Figure 1 shows a single stream SINR and the effective SINR distribution per PRB for MIMO schemes with and without FDPS. When FDPS is not used, the scheduler randomly selects users for transmission. The number of active users available for scheduling in the cell is 20. It can be seen that without packet scheduling, MU-MIMO can exploit available multiuser diversity gain, therefore has better stream SINR distribution than SU-MIMO. For SDM SU-MIMO at 50% percentile of effective SINR, approximately 10 dB gain can be obtained by using FDPS. More gain can be achieved by using MU-MIMO scheme with packet scheduling. This is due to the fact that the multiuser diversity is further exploited in SDM MU-MIMO schemes. SINR distribution for SDM multiuser SU and MU-MIMO schemes with 20 active users in the cell. Figure 2 shows the effective SINR distribution per PRB for linearly precoded SDM MIMO scheme. The precoding scheme which we used is from  as mentioned in Section 2. The number of active users, that is, the user diversity order, is 10. These plots are obtained under the assumption of evenly allocated transmit power at the two transmitter antennas, and a transmitted signal to noise ratio (SNR), defined as the total transmitted power of the two sub-streams divided by the variance of the complex Gaussian noise, is equal to 20 dB. Both the simulation results and analytical results are shown in this figure. In the simulation, the system bandwidth is set to 900 kHz with a subcarrier spacing of 15 kHz. Hence there are 60 occupied subcarriers for full band transmission. We further assume these 60 subcarriers are arranged in 5 consecutive PRBs per sub-frame, so that each PRB contains 12 subcarriers. At each Monte-Carlo run, 100 sub-frames are used for data transmission. The simulation results are averaged over 100 Monte-Carlo runs. One can see from Figure 2 that the simulation results are in close agreement with the analytical results. 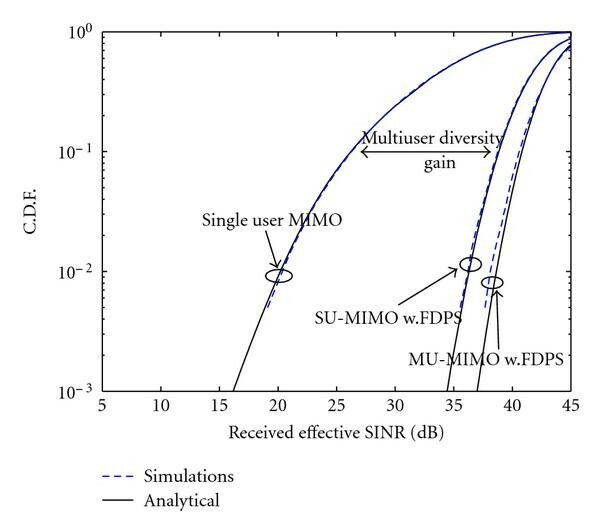 It can also be seen that for SU-MIMO scheme, the multiuser diversity gain at the 10th percentile of the post scheduled SINR per PRB is about 11 dB with 10 users, while an MU-MIMO scheme with SDM-FDPS can achieve an additional 2 dB gain compared with a SDM-FDPS SU-MIMO scheme. This implies that the MU-MIMO scheme has more freedom or selection diversity than the SU-MIMO in the spatial domain. Analytical and simulation results of SINR distribution for linearly precoded SU and MU-MIMO schemes with 10 active users in the cell. In the figure, "w.FDPS" represents "with FDPS". 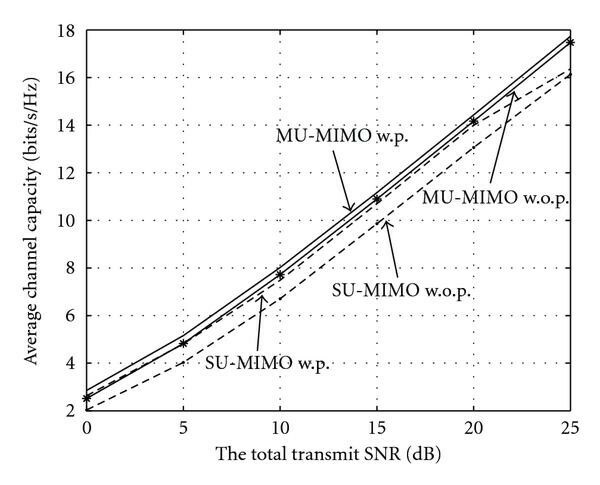 The average channel capacity for SU and MU MIMO schemes versus transmitted SNR are shown in Figures 3 and 4. The number of active users in the cell is 10. 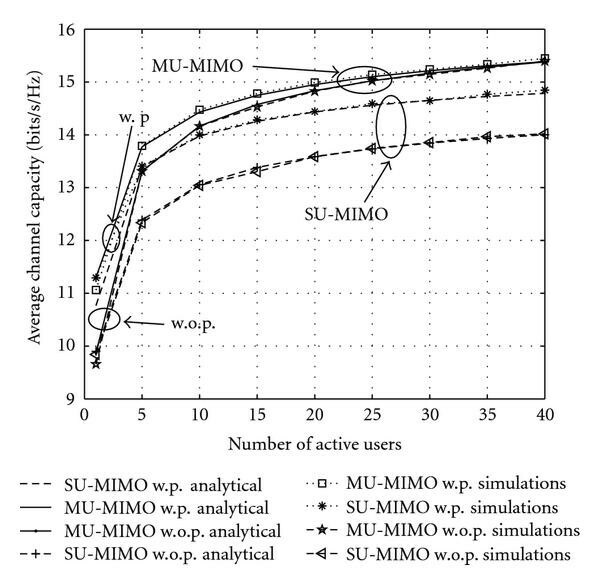 Figure 3 shows the simulation and the analytical results for the linearly precoded SU and MU-MIMO systems, it can be seen that the simulation results match the analytical results rather well. Figure 4 shows the average channel capacity comparison between open loop MIMO and closed loop MIMO system. Figure 5 shows the average channel capacity for SU and MU MIMO schemes versus the number of active users in the cell. Both the simulation results and the analytical results for the open loop and the linearly precoded MIMO systems are shown. It can be seen that the simulation results almost coincide with the analytical results. Figure 5 indicates that in a cell with 10 active users, the MU-MIMO schemes (no matter with or without precoding) always perform better than the SU-MIMO schemes. Notice that the performance for the closed loop SU-MIMO denoted by w.p. in Figure 5 is slightly worse than the one for the open loop MU-MIMO. This implies that MU-MIMO exploits more multiuser diversity gain than SU-MIMO does. 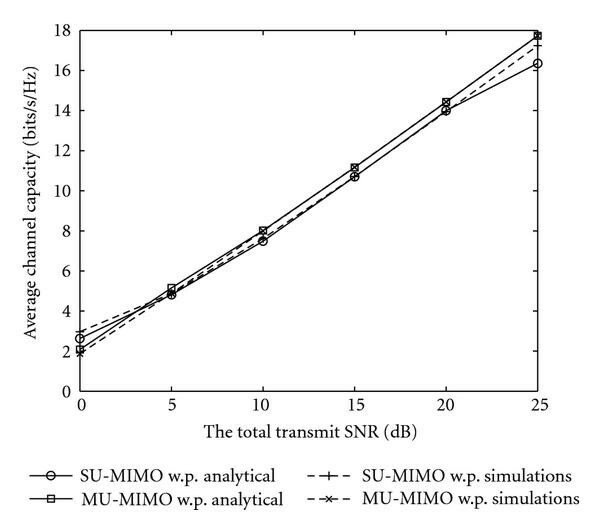 Interestingly, the precoding gain for SU-MIMO is much larger than for MU-MIMO. Analytical and simulation results of average channel capacity for SU and MU-MIMO schemes with linear precoding, number of active users is 10. In the figure, "w.p.analytical" represents "with precoding analytical results" and "w.p.simulation" represents "with precoding simulation results". Analytical average channel capacity comparison for SU and MU-MIMO schemes with and without linear precoding, number of active users is 10. In the figure, "w.p" represents "with precoding", "w.o.p." represents "without precoding". Average channel capacity versus number of active users for SU and MU-MIMO schemes with/without linear precoding, transmit SNR is 20 dB. "w.p" represents "with precoding", "w.o.p." represents "without precoding". Figure 5 shows that the average channel capacity for SU-MIMO schemes with precoding is always higher than the one for the SU-MIMO scheme without precoding regardless of the number of users. However, for the MU-MIMO scheme, the above observation does not hold especially for systems with a large number of active users. As the number of active users increases, the advantages using schemes with precoding gradually vanish. This can be explained by the fact that the multiuser diversity gain has already been exploited by MU-MIMO schemes and the additional diversity gain by using precoding does not contribute too much in this case. Note that we used ZF receiver for the open loop scheme while for the closed loop scheme, the MMSE receiver was employed. One reason why we use ZF receiver instead of MMSE for the open loop scheme is that the SINR distribution for the open loop scheme with MMSE receiver is very difficult to obtain. Another reason is that the ZF receiver can separate the received data sub-streams, while MMSE receiver cannot, the independence property of the received data sub-streams is used for computing the effective SINR as we mentioned earlier. In this paper, we analyzed the multiuser downlink transmission for linearly precoded SDM MIMO schemes in conjunction with a base station packet scheduler. Both SU and MU MIMO with FDPS are investigated. We derived mathematical expressions of SINR distribution for linearly precoded SU-MIMO and MU-MIMO schemes, based upon which the average channel capacities of the corresponding systems are also derived. The theoretical analyses are verified by the simulations results and proven to be accurate. Our investigations reveal that the system using a linearly precoded MU-MIMO scheme has a higher average channel capacity than the one without precoding when the number of active users is small. When the number of users increase, linearly precoded MU-MIMO has comparable performance to MU-MIMO without precoding. Substituting (A.3) into (A.4), we obtain (13). where and the ordered eigenvalues of the complex central Wishart matrix is .